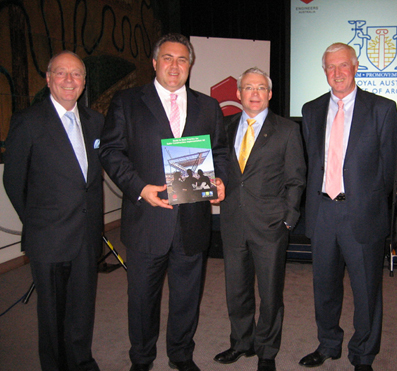 (L-R) John McCarthy, Chair, Construction Innovation; Hon Joe Hockey, Federal Employment and Workplace Relations Minister, Keith Hampson, CEO, Construction Innovation; Bill Wild, Chair Engineers Australia Taskforce for Construction Safety and Peter Godfrey, National Vice President - Engineering Practice, at the launch of the Guide to Best Practice for Safer Construction. Federal Employment and Workplace Relations Minister, the Hon Joe Hockey, launched an industry-wide Guide to Best Practice for Safer Construction at Parliament House in Canberra on 12 September. The launch marks the completion and dissemination of outcomes from Construction Innovation's Safer Construction project, which was led by Tim Fleming, Operations Safety Manager, NSW/ACR Region, John Holland Group. The project was guided by high-level strategic input from the Engineers Australia Taskforce for Construction Safety, chaired by Bill Wild, CEO, Leighton Holdings. The Taskforce consisted of senior representatives from RAIA, MBA, ACA, ACEA, EA, NCCE, APCC, John Holland Group, Construction Innovation and the Office of the Federal Safety Commissioner. Approximately 70 key industry representatives attended the launch.